This Nightforce SHV 4-14x50 is the first offering of first focal plane in the SHV line. It is built with the same quality and reliability that you have come to expect from Nightforce. 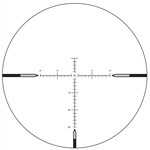 This scope features a 4-14 magnification range, illuminated reticle, exposed elevation turret and capped windage turret to prevent accidental movement during travel or in the field. It also offers parallax adjustment from 25 yds to infinity and an MOAR reticle. Field of View: 4x: 25.1 ft; 14x: 7.4 ft at 100 yd.